I am looking for 100 people to embroider words onto garments for an exhibition, Illuminating the Self(Hatton Gallery & Vane, Newcastle-Upon-Tyne, January 2020)which will explore the experience of living with epilepsy. I am working in collaboration with a team of 30 neuroscientists, engineers, clinicians and artists from the CANDO project (Controlling Abnormal Network Dynamics using Optogenetics) at Newcastle University and Imperial College, London to explore the ethical, philosophical and personal implications of the cutting-edge brain implants they are developing to try and control focal epilepsy. Epilepsy affects 600,000 people in the UK and uncontrolled seizures have devastating effects on patients’ lives. The 100 items of embroidered clothing will be hung from the gallery ceiling by wires, and programmed to move in the neural patterns and pathways associated with epilepsy. The movement will become increasingly synchronised. Once fully aligned, they will collapse onto the floor. Slowly, the clothes will start to move again, and restore themselves into their original configuration. The words will be personal testimonies contributed by people living with epilepsy and also by their carers. A wide range of clothing is being used, from historical to contemporary items. It is being donated by British designers, Hawk &Dove fine Apparel, and the public (including people with epilepsy) – from wedding dresses and veils, men’s shirts and Victorian underwear to children’s night wear. The eclectic mix of clothing suggests the very individual nature of epilepsy, and the number of garments highlights the fact that 1 in 100 people have some form of epilepsy. The Dark Self is a major new exhibition by Susan Aldworth exploring the experience of sleep. A highly original and experimental artist known for her unorthodox printmaking techniques and philosophical investigations into the human brain and identity, in this exhibition Aldworth challenges us to reflect upon our nightly transitions from consciousness to oblivion. Aldworth has been Artist in Residence at the University of York since 2014. Wednesday– Sunday, 11am– 4pm. Free entry. Artist Susan Aldworth, neuroscientist Miles Whittington and art historian Michael White explore the art and science of sleep. An exhibition of experimental monoprints produced by Susan Aldworth in preparation for The Dark Self. Admission free. Meet at York St Mary’s at 2.30pm for a tour of The Dark Self with Susan Aldworth followed by a 4pm reception at Lotte Inch Gallery to view The Art of Sleep. Free event. This exhibition of beautiful contemporary prints by two British artists challenges our assumptions of reality and identity. Jane Dixon’s photograms, Evidence of Doubt, appear to be photographic records of real organic forms, but prove to be imaginary and drawn by the artist’s hand. 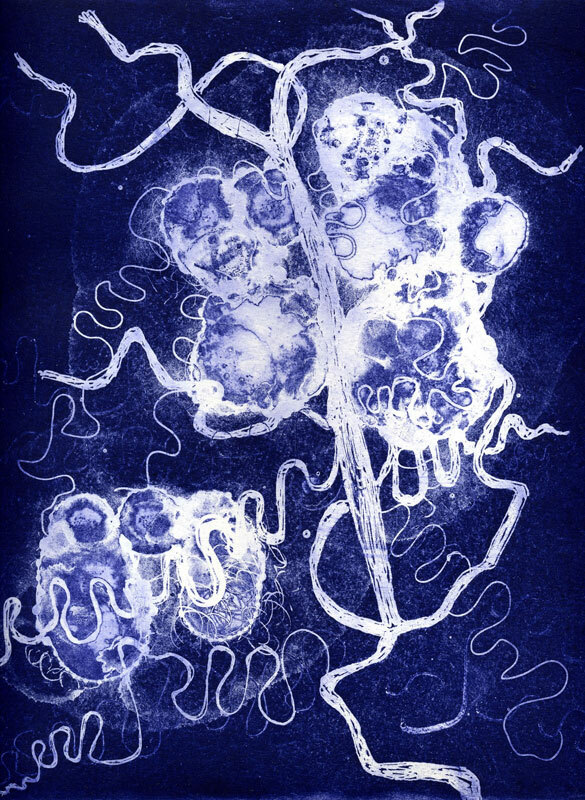 The intangible images in Susan Aldworth’s two series of prints, Transience and Passing Thoughts, resist recognition and identification, yet they actually derive from the physical touch of human brain tissue, and portray real people. Susan Aldworth’s new trilogy of lenticular prints The Reality Principle were inspired both by Freudian theory, and a question the artist found herself asking whilst looking at a medical scan showing the anatomy of a brain; what would it look like to see the inner workings of the mind, and an imagination’s moment of inspiration? The series were created as lenticulars as Susan felt the sense of movement of these time-based prints would enable the spark of inspiration to be visually represented. Aldworth collaborated with two renowned master printers on work for the exhibition, creating the ‘Reassembling the Self’ lithographs with the legendary Stanley Jones at the Curwen Studio and the ‘Entangled Self’ etchings with Nigel Oxley, ex Kelpra and White Ink studios.